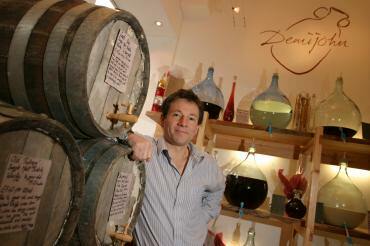 We have created a shopping experience at Demijohn that reflects my memory of the Italian Cantina in the early 1990's. We allow you to try something completely original and delicious in an extremely fun way. Shopping in one of our shops or online is not only equally as fun, as a result of our low impact retail policies of ethical sourcing and re-use of materials it is kind on the environment too. When you visit our shops you will not only be encouraged to taste what we are selling, but we will attempt to unlock the secrets about our products. Our team of passionate Staff are so enthusiastic and friendly, you will feel as though you are being entertained at a private residence. Online, while a little less personal, our detailed tasting notes will help convey a products unique quality and story. After choosing a product we then individually bottle your choice from our distinctive glass demijohns into our selection of attractive Italian glass bottles. The only slight difference from my heady student days in the Cantina is that because UK law dictates, you must first purchase one of our bottles. We cannot fill one of your jerrycans in the shop, sorry! With your filled bottle in hand, we not only hand write the product label on the bottle but can also add free personal message if you wish. Please note the bottle label and message is designed to be temporary only and can be removed if the bottle is returned to be refilled. Those lucky enough to own a Demijohn bottle are encouraged to return to our shops and have their bottles refilled for the cost of the refill only. This is not only cost effective for you, but most importantly good for the environment. If you are further a field simply post your bottle(s) back to us with your contact details and a note of what you would like your bottle(s) refilled with. We will then process your order and send it back to you. Learn more about our zero waste and ethical sourcing policies.